I’m a premium member, For some reason it keeps crashing I downloaded it on my amazon fire tv. It’s fine but I can’t access it on my phone anymore. On a plus note I love their show collections. I like the variety, but the subtitles are written poorly. I purchased a regular membership for $4.99/month then I realized I couldn't watch the shows i want since it have to be $9.99. So I upgraded it like in 2 seconds, i still got charged for both. I will cancel and find another app. I have been using this App more vs the Drama fever because the commercials actually load and not leave you hanging for over 3 minutes. One bug I noticed was that after awhile when I click into the app it’s a black screen... the current fix is to delete the app and then download it back onto my iPad. I like I can use it on my iPhone to pick up on where I left off when I have free time waiting. I just wish that like the Disney, CW, and CBS app that you don’t have to do paid membership to cast it on a larger monitor. I guess the dramas come and go.. wanted to watch. City Hunter again and a few others, but they don’t turn up anymore. Just how it works I suppose. After some years now as a VP holder it’s become clear that, despite the VPP nonsense, VIKI is the best drama streaming site/app. The other K-drama sites just don’t size up after all, I’ve tried them to no avail. VIKI has the best choices for new (on air) and old dramas, the best organizational perks (watch lists, collection lists, etc), the best with fan interactions (discussion & ratings sections, timed comments, news articles, actor page comments, etc), the best subs, not to mention the great volunteers that make it happen. Go for the VPP if you can afford it, but the VP is quite suitable if you don’t mind waiting with the delayed viewing of new shows. This is a great app you need to get this app!!!!! The Ads are so annoying they pop up every 7-10 minutes!!! You can actually watch most of the content with the free app (and commercials). Regularly updated content subtitled by community members. Watch and add comments, or just the enjoy on your own. This is one of the best dramas I’ve seen. I chose it because Park Mon Young if one of my favorite actresses and in this drama she really has a chance to use her talents. She is very well matched with her costar Park Seo Joon! The story line didn’t have all the evasions that take you into too many other stories to prolong the drama and have little relevance. This one is well written and the female roles especially. Park Min Young was able to stand by her own values. It was a more sophisticated love story. When it went back to their childhood story I was afraid it was the usual diversion, but even that worked well and wasn’t overdone. Bravo! Okay so.. I love this app, no problems with it. But recently my membership pass has been acting up, its already paid for and it doesn’t renew till Aug. 17, but on my ViKi app it shows I don’t have it and it keeps giving me adds when I try to watch a show. Again, I have no problem with this app and I love it! But for the past week its been doing this to me and I would really love it if the problem can be fixed soon. I was watching a series as a Viki Pass subscriber and now it changed over and is only allowing Viki Plus to watch. Why?!?!? All this time I’ve invested in watching the show and now I have to wait a weeks to watch the finale or pay more so I get to see the ending. Total BS. Though they are expanding their show lists; and have a good assortment of dramas, movies and shows, the fact that I have to re-log in each time I go from one device to another, makes it difficult to watch them regularly. I am a full paying member, which makes it even worse. I try to watch a show and an ad comes up I was like eh it’s okay one ad is okay and then after 10 minutes it did the same and then added another ad I got really triggered. It’s disappointing to write this review. I’ve had viki for year and pay for a premium membership but there is always some kind of content issue. A reason why you can’t watch some drama. Emailing them doesn’t work. The app has issues often on iOS and there is no number to call. They respond to emails very slowly and rarely if ever have a fix for the problem. I love it just hope it has an option for Xbox One user to watch Viki through Xbox. But lots of shows to watch and I love them. I love this app a lot and use it everyday! But recently my spot has not been saving when I watch my dramas. Someone please help me solve this problem! Otherwise this app is great and I definitely recommend it! A thing that I would love to see in the future for this app is to see what character they play in the drama. I'm presently deployed to the Middle East and my spare time I watch Viki. It's a life saver. DO YOU KNOW HOW MANY EPISODES I CAN GO WITHOUT SUBTITLES? NONE. THERE ARE TOO MANY PEOPLE COMPLAINING ABOUT NO SUBTITLES! I’m giving the service four stars for the selection because there are a lot of popular shows that are not available on DramaFever. The reason I did not give five stars is because the app is horrendous. The history is inaccurate, it doesn’t save your spot, it doesn’t advance to the next episode, and the TV app doesn’t list the shows that you saved to watch later-you have to go on your iPhone for that. In this age of streaming video, these are all basic requirements and there’s no excuse for an app that doesn’t provide it. Beside all the ads and stuff, it’s a pretty good app to watch Korean dramas! I used to use DramaFever butttt it had too many ads, so I tried this one, it’s muchhh better! I really like it cuzzz I can watch all my favorite dramaaa!!! I’ve a got a paid subscription yet Viki now requires a premium subscription to view an increasing number of shows. Furthermore, they have an increasing number of shows that have become “restricted” or unavailable. I don’t think they realize that there are many free options on the Internet that offer more programs. I also subscribe to DramaFever. They have more content and they are much more responsive to customer support requests. Viki doesn’t even offer a way to contact their customer support in their app. I am canceling my subscription at the end of this month. All of my favorite dramas in one place !! And Viki has the new dramas unlike other Kdrama sites /apps. Exclusive fun romantic ,feel good and comical dramas . I love it !!!! I like the shows Viki has to offer, but there are so many glitches (regardless if you watch in app or on Apple TV app) and customer service is HORRIBLE. I’ve have an outstanding ticket with them for 22 days and they still haven’t responded to it and there is no other way to reach them. Considering I paid $100 for the Viki Plus Pass yearly this is ridiculous. Glad I found this service!!! Love the service and variety of shows!! Excited to see more Asian dramas!! You are doing a great job!!! Me encanta este canal d Doramas, especialmente por sus traducciones al español, gracias!!! After dramafever quit on me I thought my life was over, then I gave Viki a try and now I love it as much as dramafever. I love this app, so many shows and movies! I’ve been watching “I Am Not A Robot”, and now faced with the video wont load. The prior episodes I’ve watched aren’t working! Please let me watch the rest of the episodes! Why is it telling me to subscribe when I am paying for Vicki pass and I’ve already been charged for the month. Please fix ASAP. It’s very annoying that it is doing this. Thank you. Viki plus pass supposedly includes dramas from Kocowa. I wanted to watch Less than Evil but has still not be uploaded. Kocowa has them but not viki. They make you pay more but don’t really offer much. The quality of Viki itself isn’t half bad but I wish they had more Kdramas to choose from. I wanted to watch The Heirs but it wasn’t here so I went to dramafever but dramafever has worse subtitles and keeps freezing. Please add more shows! 12/7/17 UPDATE. The latest design update is horrific. White text on black background is positively the WORST visual ever. Why is it that every so-called redesign of the Viki app is actually even worse than than the last one? And, by the way, NO I will not be paying extra for the VPP, ever. ————————— UPDATE: Now after the latest update, the Activities/History can again recall the last episodes watched. Alas, it still does not recall the last watched scene within the episode. One must fast-forward, skipping around to find the correct moment in the episode from the previous viewing. Please fix. ---------- After the massive-parent-company buy out (sell out), it's sadly not too surprising that the old-school Viki is dead and gone. Bring back the greatness that was Viki previously. Stop attempting improvements that ruin the experience, please. I love to all Asia movies bring delight, a lot of laugher and a lot of love. Thank you for your creativity of each episode. Keep up the great work your are doing. I am watching more ads than drama. This is volunteer based so why so greedy? Dec2018⭐️⭐️⭐️⭐️⭐️ Sign up through your iG account for 59.99 Pass Plus Annually 2018 ⭐️⭐️⭐️✨ Broke down and paid the $99 annual fee since we are going to be cutting bundled Comcast cable fee of $225 monthly. Please allow us to DL Episodes for offline viewing like DramaFever & NetFlix. 2016 ⭐️⭐️⭐️⭐️⭐️ Endless amounts of uninterrupted KDrama is the only reason they got me paying that monthly sub fee. Thanks to all Subbers who really make this app Worthy. Viki me encanta. I love Korea. I was trying out the Viki pass free trial and when I signed up everything was okay at first but then I tried to watch something it wouldn’t work AT ALL. So I kept trying to see if it would work and it wouldn’t. I couldn’t even complaint to anyone there was no direct way to tell anyone about this problem. NOW it’s saying I had it all along then it charged me $10!!! Are you serious! It didn’t even show that I had it so I just thought it didn’t work so I left it alone since I made no real purchase! but it still charged me! I NEED TO TALK TO SOMEONE NOW!!! And they need to undo what they did! I’m addicted. What more can I say? Great acting and great storylines! I have emailed them more than once asking why it is that I paid for the full membership and still I have commercials and I can out have the access I was supposed to have due to my plus pass membership!! They won’t return my emails and I’ve already tried resetting my account. This is in their end and they are not bothering to resolve the issue! You are very close to loosing another customer! Love this service, I would like more options on the color of the subtitles because when I stream onto my tv from the app some scenes can make reading them difficult; white subtitles on white clothing. This site is the best ever. The variety and quality of the shows are awesome.I give 10 stars ⭐️ if I could. Thank you Viki! The only reason why I didn’t give VIKI a higher rating is because of so many ADS, and wait time for an episode to reach 100% in English subtitles. The Quality of the video is the only thing I like. For Tv shows that I would like, should be based not only on shows that I watch, but also give a questionnaire, so you can know for sure. King blaze subtitles is not properly. So very captivating! Performances of all character are nonpareil! Amazing! Just wish we could see all chapters as they are offered. Unable to find out how to change membership from regular to prime. So. Frustrating! Great app, would be perfect if we could download episodes so we can watch offline while we’re on the go to avoid data fees from our mobile providers! First off, why do i have to have a Viki pass JUST TO CAST IT ONTO MY TV. Like are you that hungry for money? I get paying to be ad free and to be able to watch episodes early, but its dumb. My family and friends would like to watch shows together too, its easier to get Amazon firestick and just stream it from viki there or even have it jailbroken and watch it for free all the episodes there. No point in getting Viki on other devices or paying to have it cast. The app will not let me log in and sometimes won’t load at all. It used to work when connected to WiFi now it doesn’t load at all. My cellphone data and WiFi signal is strong. I play games and stream other movie apps without an issue. Please fix this. Thank you. P.S. I use iPhone 8S Plus. Viki AirPlay don't work in ios11. Please check. Other apps I have no issue. Apparently it’s not enough to just pay for the standard pass and be able to watch everything without ads. You now have to upgrade to Plus and pay double to be able to watch certain dramas sooner. This is just bull. Canceling my subscription and moving to DramaFever, bye. Within the first few days of getting my new phone, this app disappeared from my home screen, while my setting and App Store both claim that I “have it downloaded” and that I “have never used” it. I have tried deleting and reinstalling the app multiple times, restarting my phone, and I even updated my iOS to the latest version. I also contacted Viki about this problem and they have not gotten back to me about this. It’s been almost two months now, and I have been paying for Viki Pass for more than a year already. I have no idea how to fix this problem on my own, but no help is offered. Whenever I get deeply interested into my show, A AD COMES ON! I came over from Dramafever in hopes to still enjoy my dramas. At first it was pretty good, I paid for the American Plus Oass with Kocowa and thought that I would have access to all the shows that related to Kocowa. This however was wrong. The problem began with the app not letting me watch Kocowa shows saying I was not paying for that, but I was and I checked with Apple to make sure that I was. I was going to contact them about that but decided to wait about a week in case it was something in the app that they were trying to fix for others too. That didn’t happen, and today an addition problem arose. Now I am getting advertisements throughout my shows. This is clearly not acceptable if I am paying $9.99 to not get adds and to watch the shows I want. Anyways I have emailed them, and until they respond to this issue I will leave this comment here. I have heard that some others have tried to email Viki but got no response. So if I don’t either, I will be unsubscribing and getting a refund from Apple. Honestly, this app is amazing! I’m so excited to use it. I’ve been able to watch one of my favorite shows on here and I now I remember why I love it so much. A must need in your device!! This is the best app for me to watch idea más on, i just wish there were more lol. The only thing I think can help it improve would be to make the scrubber more like the android mobile version- which I think is the best thing in the world! The dramas are fantastic and exciting. Each person in the drama always has a life story from their view point which makes you really feel for them. Love the history dramas!!!!! Love viki but hate paying a 4.99 a month. a lot of room for improvement! there could be a lot of improvements that would make this app so much more efficient to use: - there should be a “continue watching” section on the home page when you’re browsing movies. it’s annoying to go into the “history” section just for that, and sometimes it doesn’t show all of the videos that you’re currently watching, and it doesn’t list the episodes in the right order. i have to click into it to open up and then click on my episode. - on web, whenever one episode finishes and another begins, the page reloads and i have to expand the video size again. why not have this transition automatically instead of reloading the page over? - the subtitles are not reader friendly. sometimes when there is a long dialogue the width of the sentence expands from one edge to the next and that makes it hard for the user’s eye because they will have to scan with their heads. it would be nice if the sentences have line breaks to match with the flow of speech, or have shorter sentence structures and put them on multiple lines. these are typographic rules that would make it much more visually friendly. thanks! Gracias por los doramas que sumas a mi vida !!! Es mi único escape y descanso!! This is a decent app, but it’s unfortunate that there isn’t a “next episode” button while you’re watching a drama. You have to click out of that episode and then select another. Also, why doesn’t the app allow you to read episode descriptions before selecting them. It seems kind of silly to not include these features when every other streaming service I know of does. It’s 2018. The app has good shows but for some reason the subtitles keep disappearing half way through the shows. It’s irritating as I’m trying to watch the return of Superman and have no clue what is being said since the subtitles are turned on but aren’t appearing. As much as I wanted to love Viki because I’ll admit that it has a good variety of shows I love to watch, but I’m paying to watch and yet the subtitles are NEVER on time. I always end up having to wait more than 2 days for the subtitle. Right now for a show I’m watching I’ve been having to wait 2 weeks for the subtitles. If I’m paying $9.99 a month a expect there to be subtitles. I wish Dramafever never shut down. the app is pretty good but the ads are horrible if you don’t pay for a membership. if you click on an episodes starts off with three ads and then if you click off by accident and then click back on you have to rewatch those ads. it’s ridiculous, i already watched them and now i have to rewatch them? also there are like fifteen ads per video, what is the point? I give Viki 3 stars although their content is pretty great. One of the reasons I was with drama fever for so long was because of their offline viewing for their paying members. When they shut down I came to Viki. But Viki doesn’t support offline viewing. Drama fever also had ALL episodes of running man. I couldn’t watch approximately 60 of these episodes (the last ones with 개리) because Viki doesn’t haven them and drama fever shut down. It was advertised for discount price and charged me regular price. Where is the contact info to get it corrected. Do like the app though. The worst part, I’ve not gotten to log on at all. Emailed twice but no response, they’ve my money so I guess they don’t care. How come your excuse is that the series unavailable in our zone? But it was available via Drama Fever in the past? Can’t you show the latest series more too not only old ones? Since drama fever had shut down, I wanted to try Viki and let just say it not been pleasant. First of all, they don’t have the complete season of running man, the first is episode 265 can’t watch old episodes and secondly some shows have restricted access bummer. Thirdly, the issue of their support system not having a phone number to call but just email which takes a whole lot longer to resolve the issue. Lastly, My issue with Viki is that I subscribed for Viki Pass standard through iTunes and I haven’t seen the benefits of subscribing which I was charged $5.30. Contacted ITUNES phone support immediately was advised to contact the third party which is Viki and unfortunately, Viki doesn’t offer phone support but only email. I logged my complaint and they said will respond in 48 to 72 hours and days have gone by and still, this issue has not been resolved. Definitely never subscribing anymore or watch anymore with Viki. Dramafever was the best too bad they are gone. Awesome shows with minimum and tolerable interruptions. The content is delivered through great quality and accessible through awesome well-rounded subtitles. Overall I’m having a great time even personalizing what I’ve watched in order to keep track of everything, I’m glad I found this app. I only got viki because Dramafever went down. I don’t mind the advertisements but what is annoying is that I will have multiple advertisements playing at the same time. Another annoying thing is that while in the middle of the show, Viki will close off my video and take me back to the homepage. What is up with that? And yes, my app is up to date. So many bugs on Viki, I’m very disappointed. I have the latest version and now it prompt me to update . I can say, I use to love DramaFever, but it had 3 ads every time I fast forward or skipped through a film. With Viki, there are only two and they're short and you have the choice to skip one of them. However, I am giving it a 3 because I do experience some difficulties when watching my show...such as freezing. &' I can't activate VikiLearn on any of my devices. First, it was upgrade to watch without ads. Fine, did that. Now locking viewers out of shows until you pay more..double what your paying to watch without ads. Or, have to wait on some of them. Think this is a bad move on their part. Is it because Viki is now Viki Rakuten? I can watch some of these locked shows on dramacool for free, Netflix also. Also there are quite a lot of dramas out there that Viki just does not have. “Black” for example. So unless they get a lot more drama’s in their line up, I won’t pay for any more monthly increase. 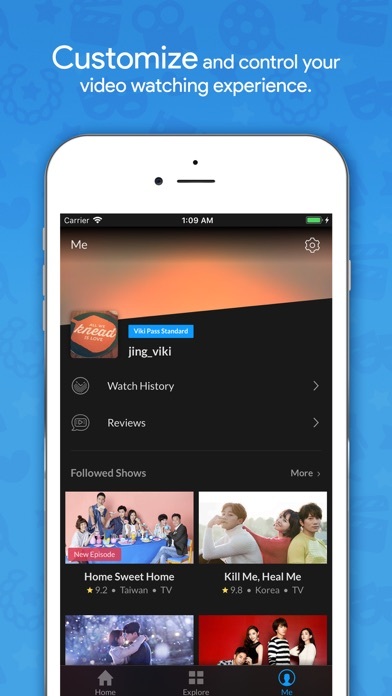 With that being said, Viki is a first rate app for those who love Korean dramas. Video is clear, no buffering, remembers where you left off, fast forward or back, and subtitles are good. Don’t speak Korean, so I’m quessing on the subs. Viki was working fine on my phone but these last couple of months it’s been crashing often and would not connect to my phone data and only works over WiFi which is annoying cuz I don’t always have WiFi. Also, I know for a fact that it’s not a issue with my phone data cuz all other apps (including Netflix) stream movies just fine. I hope you can fix this soon. I am using iPhone 8S Plus at the moment. Much better than icdrama.se since it can track where I left off. Will definitely try to get rid of the commercials later. My Healing Live is constantly buffering for the past 3 or 4 weeks. Can you fix it. Love Viki,, relax every night with it! Great site for Asian films but too bad I can't get it on my smart tv. Lost since another site is gone. I know Korean dramas are all the rage these days, but I really really love the Japanese dramas... Please add more Japanese dramas that are current! I don’t know if anybody’s app does this but whenever I sign in my account it will always log out by itself. It’s kinda weird because when I sign it I don’t even watch it and the next day I have to sign in again. I want to get back to my show! I was really enjoying this app, & I was in the middle of a series when it said to update. But I can’t update, & I can’t watch my show. Help, help! SOS! I’m really sad I can’t watch my show! I try to watch a show and it says you need the latest update that takes me to the App Store which says it was updated to fix bugs. But there is no update available it’s just an endless circle from app to App Store! I was trying to watch the 3rd episode of The Last Empress and it keeps reeling me to update the app but there is no update!! Won’t let me watch anything even though I updated. Tried turning phone on and off; did nothing. Also deleted the app then reloaded it; did nothing. Please fix this!! is there supposed to be a new update because i’m not able to watch my shows due to a pop-up that says the version i have is not able to watch the shows i want to watch. please fix soon! otherwise, i absolutely love this app!! Enjoying every bit of the tv shows with people posting msgs and cracking up with silly notes while watching. The app tells me I have to update it to be able to watch the show, but last last available update was one or two weeks ago and I did that update. Deleting that app and re-down loading it isn't helping and neither is turning my phone off. Please fix this soon because I truly like the app enough for me to actually pay for a subscription but since I paid for it I've only been able tp actually use the app three time. I try to watch a show and it it says u need to update I go to update the up says open not update and it does not let me watch the show😫😭?? I cancelled my free trial subscription, before the due date, but the apple charged me at $4.99 for one month. I was dissapointed with the subtitles with the new show “fates and furies”, the last 2 episodes 7 and 8 are a bit funky and up to this moment the episode 8 subtitles is only 98%. I’m really dissapointed, you lost me as new valued customer..
Nice app! Innovative. Easy to use. Zero of bugs. It’s saying I need to update the app in order to watch the episode I want to watch. but when I click on the “update app” button it takes me to where you update apps but doesn’t have an option to update it?? I’m so confused? I do really like this tho, I haven’t had any problems with it till this. It keeps asking me to update the app but the app is updated. I’m not able to watch my shows because this notice keeps coming up even though the app is updated. Please fix this. I had this app for a long time, I love it! I would recommend it to anyone who likes good Korean dramas! ^ and i did updated it , it’s on the latest but my shows still won’t play . I really love the app, but I don’t like the fact that you can’t download shows. I don’t have internet at work and would love to watch episodes on my lunch break. Drama fever was great in that aspect(very sad they shut down)and Netflix has limited shows. But you have great show choices! But I wonder why drama fever could get shows that you can’t. I would still recommend this app to other people though. Do not purchase this drama broadcast channel....it really does not offer what it promises.there are 2 price guides...$49.99 or $99.99 annually.the $49.99 price does not allow you to see the current dramas.i do not want to purchase the $99.99, because there still to many unsubbed drama titles on this channel.viki company should be ashamed. If viki would remove the dramas that are partially subtitled or not subtitled at all;then,viki would lose a lot of customers. I am a premium account holder ($49.99) and can access the older dramas. It really becomes disappointing to start a drama and realize that you can't finish the drama ...the drama not subbed to completion. Or the drama not subbed at all.would I be willing to pay more for my premium account for viki to hire employees to complete English subtitles ....then..the answer is a definite ( YES. )but I am not willing to pay more ($99.99)just to see the most current dramas. In the United States...we have a better business bureau..I would report viki to the better business bureau for fraud. I have subscribed to Viki for three years now. I love being able to watch these shows without fear of being hijacked to another site like other Kdrama sites. I would give this app five stars if it wasn’t so dark. I truly dislike the current update (12-2017). I hope they change it soon. The previous app was much easier to get around. Supposedly the darker colors are easier in the viewers eyes for night time watching. However, getting around the new dark site is even harder on my eyes. I can’t see much of anything now. I'm rating a 5 again just because I'm an old fan. I know you guys want to be creative and all but thirst two recent updates don’t function well. Thank you! It won’t let me login and it keeps on saying video failure. Please fix. I really love the way Viki always have new shows and new movies to watch. I REALLY APPRECIATE the effort of the volunteers who provide subtitles to all of the shows...THANK YOU! Wasn’t for you these shows would have not been as good as they are. Thanks for the app is good, but lately I’ve gotten a problem can’t enter in the account. Please fix this problem. Thanks for the attention. I recommend this for you foreign language lovers. It’s wayyy better than DramaFever and there are my nearly as many ads as other apps have. It’s efficient and free but I recommend $5 a month because it’s honestly worth it. I don’t mind paying for subscription it’s worth it! I love Viki it’s the perfect app for k-dramas and any TV show I watch it daily and I love it also I love the comments that show by time! I love this app it has free tv shows and English subtitles.its really entertaining,but it gets annoying because of the ads u can’t get a viki pass because I’m only 12 and can’t pay for it but its worth giving a try. The translation has been so slow this week. Translations present 3-4 days after it is made available. Nice design but while playing a show app will crash after about five minutes in play and continues to crash after shutdown and restart on phone. First time ever having this problem after being a long time Viki user. If not fixed I will likely cancel subscription. I appreciate when I can watch more Japanese TV drama. Thanks! I’ve been wanting to rewatch this Japanese Drama “Mischievous Kiss” only to find out this app took it out. I’m just super disappointed and annoyed WHY dfq they took it out. It was one of the best jdrama there was. Like WHY. The app is really amazing but I'm currently watching The Fighter of the Destiny, a Chinese drama, and several scenes don't have subtitles. Es una aplicación con mucho contenido pero muy restringido incluso si tienes el pase anual hay contenidos que están bloqueado en tu región y acceso restringido en muchas otras. En resume solo pocas se pueden ver. Unas acceso restringido y otras restringidas en tu país. Muy decepcionante. I’m enjoying my dramas! But one ad makes the whole thing silent. I believe it’s the Hyundai commercial. Plays about 3 seconds of audio, then sound stops, including my drama! Then I have to swipe away & watch ads all over again! Love this platform! Connection, subtitles, content is all around great! Not a complaint, just wish they could pick up the movies and shows that DramaFever had previously before they shut down to round out the content. i’m paying for the viki pass plus but it still won’t let me access episodes or get rid of the ads. it did this during my trial too, but i figured it might fix itself when i actually started paying. it didn’t. the pass works everywhere except for the app on my phone. my laptop and roku tv have no ads but still can’t access next episodes that are locked by a standard pass. i’m paying 10$ and i’m still waiting just as long as everyone else for content? please fix this issue soon. Fix ur subtitle. It’s no showing on All out of Love #55. Glad to have this so I can watch the Chinese historical dramas I love so much. I love Vicki’s content and overall the app is a good experience and has a nice user interface, but there are Apple TV bugs that drive me crazy! Most notably the lack of a viewing history when watching via Apple TV. I have to literally write down what episode I am on on a piece of paper in order to keep track. I see from these reviews that this is a known issue; I hope fixing it will be prioritized. Another issue is that it makes me resign in to my account, kind of randomly. Why doesn’t it keep me signed in unless I sign out? I am a Viki pass subscriber and enjoy using the app otherwise. Please look into fixing these issues! I love using this app. Am watching a show and a purple add comes on and freezes the screen. Have to exit the show and start over. No thanks. This app is amazing you get to watch K drama and more.This app is good for entertainment to I’m glad they made this app I hope they never take is down. Sooooo, the last couple of days the timing of the subs just decides to get off track while watching. I have to get out of the app and come back in numerous times during an episode. The update took away “watched” on episodes that have been watched. Not convenient! I hope these problems get fixed. I’ve had this app for quite a while, while there is a great selection of shows they remain untranslated. The team in charge of subbing/subtitles is always tragically behind. The claim is that close captioning is done by volunteers. Which I don’t believe. There are paid subscribers and constant ads so the owners generate a generous amount of revenue. Pay people to translate shows before putting them up. I’m so happy to find a site that has hundreds of korean dramas! Lately I noticed in having to link my appletv every other day since I’ve upgrade my vikipass. This is getting annoying that I have to continue to link it together since appletv app fails to stay login. Great drama; great cast. Enjoying it very much. This apps shows Viki content on iPhone/TV and plays Ads on both the iPhone and TV but won’t play the program on TV. Keeps requesting mirroring be turned off which means only phone viewing. So either one of the following happens: 1. Ads viewed on phone & TV 2. Program viewing only on phone & audio on TV 3. Blank screen on both phone (playback controls visible) & TV with only audio. Just updated the App and got progress: 4. Blank screen on both phone & TV with subtitles on both - told u progress I wouldn’t spend my money on this provider if they are only one blocking mirroring for TV. I guess that’s why I enjoy Netflix better - watch on my TV with controls on phone - which nows offer their own Asian drama. Get it together Viki!!! I upgraded to the Viki pass plus Kokowa, for a year for $99.99, almost a month ago, and the still have me with the Viki Pass plan! I tried to contact their customer service, but all you can do is send them messages via the web, they have no active customer service. They still have not even responded to my request. Today is 11/27/18. There was an advertised special for Standard pass that was to expire 11/28/18. I created an account today (11/27/18) and immediately the sale offer has disappeared. Not a very honest first impression. I was going to sign up for an annual pass but will no longer do so. Other than the adds I love this app. At first I thought the comments would be annoying as they were on the top of my screen, I left them up and now I enjoy watching the comments speed by when exciting events happen in my drammas. I also enjoy reading the comments so I know that it’s not just me thinking about parts of the show. This app is excellent and easy to use. Easy and accurate subtitles in English. I love wuxia and costume and period drama’s. Even though they do have them I just wish they had all of them but still I have no complaints. Very worthwhile app . I also have it on my cellphone. yes it has some ads each episode but it’s worth it and they have a whole selection of wonderful movies/shows !!! I don’t understand I’m still seeing ads while I’m paying 4.99 monthly? What’s up with that? Will be unsubscribing and deleting app. Total disappointment. Expecting more tv shows and tv cast is available only for pass members. This is by far the best app to watch Korean dramas and Variety shows. Unlike DramaFever, Viki takes so much more longer to get the episodes subbed. I understand you are all busy but it’s quite annoying when I have to wait even longer to have the episode be subbed little by little right after I’ve waited for the episode to be available. Also, there aren’t many Korean dramas available, nor are there many updated. Overall, Viki is okay, but it can be greatly improved. love this app. it's my addiction. Since I joined Viki, I haven't watched regular tv. so many great shows and movies. I love Viki! It's great for Drama fans! I just wish they paid the Subbers 😭 so that there is better service delivery. It was a really nice app, it was fast; had all kind of dramas and shows. But after a few days of using it. It started to slow down a lot and every time I watch something it takes like about 10 mins until it can go to the highest quality, or I always have to reload cause it just suddenly stops. I love Viki! I watch my k- dramas through this app and I recommend it to everyone! Awesome awesome awesome!!!!! I wish this show would never end! I love this app. Who can say no to free entertainment. There are around 8 adds during a one hour segment. Not terrible and the adds make the entertainment free, and it is very very good to stream free entertainment. I love this app. Please work harder for the English Subtitles! Ok. I’m going to compare Viki’s work versus Drama Fever. I’ve been a fan of KDrama for my life and since DF is off the market, i stuck here with Viki. Beside the fact that their app surface is lacking and not that convenience for user, after the drama Doctors (2016), i now realize they also did a purely lazy translation job! The way they arrange each line is so so so confusing for viewers. They also skipped a lot of important lines in the movie, it makes me have to google everywhere to find out what? why? how are they acting that way! It’s horrible! Also their English sub for this drama (and many other ones) are awkward! There are many parts that meaningless, as of they are using google translate instead of working properly on the context! This is an absolute disaster! I will just hang on them until i can find another app streaming Kdrama in the US!!! The dramas have unique plot lines and the actors are very good-looking. They have me crying, laughing, and smiling along them and it’s so refreshing to find an app with free dramas like that, you know what I mean? I’m pretty sentimental so I’ve been gaining an attachment to the dramas that I have been watching and overall I would recommend to try it out even without the Viki pass, since to me it’s well worth my time. Not all episodes of each series you watch will have subtitles. Nothing is more frustrating than watching an episode of a movie only to discover some parts have subtitles and some don't. Even more enraging is watching an entire series then finding out that the final episodes DO NOT have ANY subtitles! I paid to watch AND understand Korean dramas. Viki is clearly misrepresenting their app and the service they provide. Equally frustrating is that VIKI HAS THE WORST CUSTOMER SUPPORT TEAM. The NEVER get back to you whenever you report a problem. All they do is send you the same computer generated email with a different reference number each time you report a problem. Their email basically states that "due the rise in help requests, it may take some time to get a response from them". I guess a lot of people are having problems not just me, because I've been asking for help for over 2 weeks now. They could be better. Some don’t make sense. Some words are misspelled. Sometimes there are no subtitles on a few scenes. Also, please translate what a text message says. Viki let me watch some dramas I’m paying to watch them but it won’t let me finish watching them. Only got the membership because I DIDN'T want to see ads, I got charged for subscription which included no ads. Like help me out here bruh? I wrote an email and everything. I just wanna watch my dramas in peace! I watch a lot of BL but some of my favorite ones are not on here and there are a lot more people out there who like BL so the app might get more popular if u put more in here. Since Dramafever is no more. I downloaded this app to watch my dramas. So far it’s been good. Small Price for subscription, that is suitable for me. I like the lock screen feature. Very buggy, shows won’t load. I’m paying for a really unreliable service. If this continues, I’m calling it quits. This is a company run by incompetent CEOs who only care about putting out non Korean shows, when they should be spending those resources on making a quality and functioning website. Try Kocowa. Or OnDemandKorea for a much more reliable and less buggy platform. Subtitles are written by volunteers, not qualified professionals. You will see some wrong translations based on their personal interpretations. However, I will give 2 stars because they don’t censor Korean shows like Netflix does. Netflix censored a Korean movie called Ilang. They removed a kiss scene from the original because I assume they are uncomfortable with seeing Asian guys making out with a chick. The setup is confusing, too complicated. I am not comparing you to Dramafever but their programming was easier to follow. I am enjoying the shows once I get used to finding them. I also notice that some of the shows have different titles than Dramafever. I do thank you for being on the air, so I can continue watching my Korean dramas. It was advertised for discount price and charged me regular price. Where is the contact info to get it corrected. Do like the app though. Viki is a great app, and I absolutely loved it. (besides the ads of course) But I was hoping for some dramas that I wanted, so I was hoping you could add these following kdramas: Goblin Train To Busan ————————— Thanks in advanced if you do! I both love and hate Viki! I wish it was more user friendly. I feel forced to buy the subscription to watch the shows I wanna watch. Then I buy it, and still have restrictions! Why is that! I really miss dramafever🤨 Overall, I think those are my 2 biggest complaints. Oh, and not all the shows I wanna at h are on it. Like big popular shows! Ugh! But I am greatful it is still around for me to use! Sending lots of love to the translators for their hard word and diligence with English subtitles. Your awesome. Directors thanks for the job you do in making it all come together. Actors, one word Awesome! Thanks again. Newcomer to Viki. Used to love it but now there’s this plus plus vip thing or you’ll have to wait like ... what too expensive. I REALLY LOVE THIS APP!! THE DRAMAS ARE SOOOO GOOD! I recently just started using Viki again. Paying for this app but I still see multiple ads. I’ll be canceling this app for false advertisement! 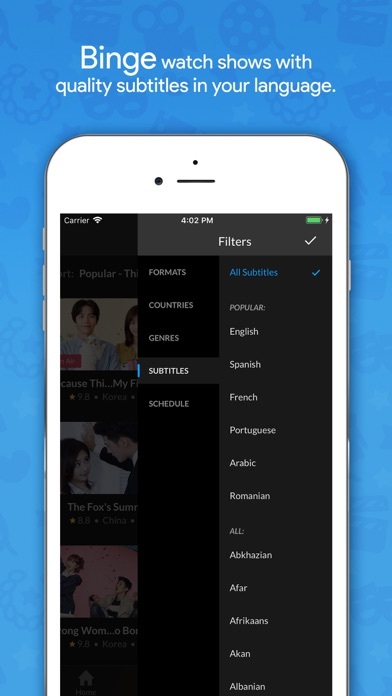 I recommend this app if you like to watch foreign shows (Asian). I have a year subscription $35 on discount offer ($50) very good so far. Living in the land of Hollywood you would think there is no where on earth to find better entertainment. I found it in Korea. Talented writers, actors and actresses, and film makers. Beautiful locations. They do it without senseless violence or harping away on political correctness. Just great entertainment and beautiful music. VIKI streams it and provides great translations flawlessly. works, but where’s the english subtitle?!? Everything was working fine until the latest update, which brought no workable english subtitles :( Please all, try not to update to the latest software yet until another new update comes. With paying the membership, please viki support team... please please fix this issue ASAP!!! I need my english subs!!! Otherwise, there’s no need to keep the membership going. So I have been watching a tv show called “the good witch” and now the subtitles aren’t working, can you pleas fix that? i’m paying for the viki pass plus but it still won’t let me access episodes or get rid of the ads. it did this during my trial too, but i figured it might fix itself when i actually started paying. it didn’t. the pass works everywhere except for the app on my phone. my laptop and roku tv have no ads but still can’t access next episodes that are locked by a standard pass. i’m paying 10$ and i’m still waiting just as long as everyone else for content? please fix this issue soon. TELL ME WHY YOU HAVE MY TEN DOLLARS AND IM STILL WAITING JUST AS LONG FOR EPISODES AND ADS??????. Since Dramafever no longer exists Viki is the next best thing. I think that Viki has a good selection of dramas and movies, they obviously don’t have all my favorite shows. One thing that annoys me is the fact the Viki doesn’t have an official subbing team, they only have volunteers do them. It’s quite annoying since sometimes (usually) episodes are not fully subbed, which is irritating. Other than that, it’s not to bad. But the only reason why I’m giving it 3 stars is because of the selection. Great dramas, excellent subtitling, and great price for subscription, This is my new favorite channel!!! I’m paying 10.99 a month for “no ads” and I still get ads I love this app but it’s either fix it if I need my money back.. The waiting is long. It takes two or more days to get the english subtitle. Why was my subscription cancelled?? On January 2018 I paid for a years subscription for VIKI as of October 2018 between the App Store, google and VIKI the subscription was cancelled or deleted. Please reinstate the subscription or refund my money!!! Annoying adds Every 10min or less!!! Not worth my yearly subscription!!! Fix that!! I would like to see more titles from Thailand on this app. I just finished watching “Blood and Treasures” and “The Monkey Kings” on Netflix. These are excellent dramas that are not offered by Viki. There seems to be a dearth of Thai programming on Viki. Please expand the offerings. The movie and tv show offerings are really geared more towards Korea. Otherwise the app is actually pretty good! In upgraded to cast videos but it doesn’t cast. They say they fixed with the latest update but it hasn’t worked. I’ve used them in the past and this hasn’t happened. I am seriously paying for nothing. I keep waiting on the update that will fix the issue, but I’m to the point where I am going to cancel and go with another provider. If you aren’t able to fix it at least credit is but you are taking our money and providing half the service. That’s not right. Please add the next episode button, the newest version doesn’t have this!!! Also would love 30 second skip option!! Other than that it’s perfect!!! The comments are so entertaining, that is the biggest advantage over drama fever, also if you add a recommended dramas section like my drama list that would be great!!! I also think the selection is way bigger than DramaFever. The app was awesome for the first year. But recently it goes blank and I have to delete and restore again. This has happened 4 times in a week. Thank you for continuing to stay in service and letting me enjoy my Korean dramas. I had Drama Fever before as well and they just closed down. Really glad you guys haven’t left me. Thank you for all you do. How much longer am I going to have to depend on thumbnails and memory to know what each episode is about if I wanted to rewatch a scene? Or if I was interested in a drama and wanted to know more; is a synopsis of the series and a thumbnail the best you can do to entice me to watch? If that’s so, then episode summaries is not the only thing you need to work on, but apparently marketing as well. This is the best thing EVER! Dramas here cannot be any more funnier and romantic. I suggest you get this right now!!!! What does stop nagging and wait mean? I don’t care if you are a volunteer, who do you think you are talking that way to a paying customer? Train your volunteers and staff to show respect and gratitude to paying patrons on whom you rely to keep your precious project going. Watching episode every time bring funny, drama and mostly romance. I enjoy every minute of it better than any show I watch. I do not like trashy show to watch. Clean show bring better result. They don’t have the broad range of shows DramaFever does but the HD functions 10 times better and everything is at a cheaper price. This drama site is the great. I use to use drama fever, one day I was watching a show and right in the middle of it gone. So guys are lifesaver. Only app I have now but I need my shows from DF!!! It’s the only app I can watch all my Kdramas, cdramas, tdramas and Jdramas. I’ve always liked Viki but now it’s all I got. I just wish they could get the dramas that Dramafever was airing before they decided to terminate services. I need the beauty inside and 100 days my prince!!! I expect better service for $10 a month. Episodes are not completely subbed. It takes too long for new episodes to release. I miss DramaFever! If the service doesn’t improve, I will stop watching Kdramas altogether and try something else. Viki May cause the loss of K fans. I have had other memberships with other sights and when they say $4.99 a month fee, that is what I expect. I got my bill on my phone and it was $5.30, with $.31 tax. I was surprised that tax was added. I have had Viki before and it froze and I was disappointed. Now with Drama Fever being gone, Viki is all we have at the moment. I really hope they step up and get really good dramas and quality service. The show is awesome but a lot of advertisements. Overall its very good. The only thing i don't like is as a standard pass customer when it comes to air dramas we dont have access to the new episode until 2-3 or so days like the premium pass customers. Wish I can watch without ads. Also, pls add more shows! Thanks! Me encanta yo tenia Dramafever y ahora estoy con ustedes me encanta. Solo necesito saber cómo puedo ver los Dramas sin anuncios y si los comentarios de los usuarios durante el drama ? With the shutdown of DramaFever, this is the next best app for dramas from Korea, Japan, China, Taiwan, etc.. Viki gets 5 stars for contents, lots of good and new dramas. I am not giving this app 5 stars because some navigations are clunky and rather cumbersome. The major area of point loss is the inability to download dramas. Amazon Prime, Netflix and DramaFever (when it was operational) all offered that option at no extra cost. By not providing this functionality is few steps behind. I subscribe but can not access to all the movies unless I upgrade to premium, with DramaFever I got everything when I pay $4.99 a month. The premium is for people who want to download movies to watch offside. Viki should do something about it. I loved this app, but now I’m very angry because I was paying Viki pass, but when I wanted to watch any episodes about “Viki pass” the app said “you need Viki pass”, while I payed my membership 😠 I wait for two months for one solution, but it was same. I really like the movies, very good story-lines and actors/actresses. Also, I like that they are good-looking. Kudos! subtitles not showing in some parts of the shows. why? The app itself is okay, and the dramas are good, but you can’t even access certain dramas though you’re paying for a general subscription. You have to pay even more for an upgraded subscription to watch them, and that’s just not right. Since I’m paying monthly, all the dramas should be accessible. To only be able to watch certain dramas even when you’re paying monthly is a rip-off. Hello, so I am wanting to get a pass but Viki keeps telling me that my phone does not accept app purchases. I can’t find what I need to in my settings to fix this. Could you tell me, on an Apple phone, where I am to go to change this setting? And there are some videos that are on air but will not play. I’m trying to rewatch old episodes also and I’m only staring at a black screen. Please fix this issue ASAP. Then I’ll rate again. A slap to the face! So I purchased the Viki standard pass and the app is not registering that I have it. It keeps glitching and switching back to not having a pass at all. All videos still have ads. Some say I need a standard pass to watch..but I have it. If I go on the website, it works fine but not on the phone app...help?? Very frustrating. If I’m paying for something, I should be getting the service, but I’m not. Might as well not even have a pass. What’s the point? Am so hooked watching all the drams on viki. Fix ur subtitles. There seems to be a glitch as the sentences are stuck. As a new Asian drama watcher, I really enjoy this app. I was worried that the subtitles would not be as thorough as they are written by volunteers, but I was thrilled to find them to be more complete than on other streaming sites. Sometimes the dramas use a song to move the plot forward, and on other sites those songs are not subtitled. The dramas that I have watched on Viki subtitle important song lyrics, as well as the OST. Love that! A real selling point for me! Keep up the super subbing! Thanks for doing it! You have toooooo many repeated advertisements in one episode. Can you lower that? It is always having trouble loading the TV shows I want to watch. Everything on my phone is up to date so NO it’s not my phone. I never have this much trouble using DramaFever. I liked it. It was enjoyable but i just don't understand why when I'm watch the show they have to show the discussion posts of people. Whether it's on a ongoing drama or a completed one? That's the only thing that bothers be but the rest is great! Since the upgrade to the most recent iOS version I notice that the app tends to go dark or black. Please fix. Thanks. So I used to have dramafever it was great and all but too many ads and now they just kind of confusing and extra overall so I deleted it. I then started to stream through random kdrama sites, but the popup ads ruined the experience every time and the videos would crash. Then I resorted to viki and holy sh*t, this app is amazing. You can pay for no ads (but im broke so lol), even if you don’t pay there won’t be a crazy amount of ads every 2 min. Aside from just kdramas, there is chinese dramas, Vietnamese, etc. You can also add comments while you watch and rant with others who are watching or just a have funnest time reading all the timed comments. After you are done watching you can go quickly find another one to watch. I’m really disappointed that I have to make this kind of review because I have been a Viki user since 2013 and I can’t even get videos to load anymore! I stuck with viki all this time, even became a paying member. I hope the issues will be resolved soon so I can give a positive review. Found this app not too long ago and really enjoy it. I haven't seen lots of Korean movies lately and I am hooked. However, there are few movies which overlap. For example 1st movie of Kim Soo Ro, suddenly restarted after 20min. Slave Hunter & Tales of Fox too. Now I am watching Flames of Desire and at least 3-4 chapters are overlap as well. For sure episode 8,9,10 Oct 17,2013 Terrible! After the latest update, commercials every 5 minutes. Ridiculous. I don't mind paying so I can watch with less commercials. Oct 20, 2013 OMG! What the hell? The same commercial within 5 minutes. I hate to see galaxy samsung commercials. He'll with skinny young boys dancing in the roof. Stupid stupid! Stop the commercial and make it a paid apps. Oct 1, 2018 What is going on here? Every time I click on your app, it’s blank. Can’t watch or see anything. It has been 4 days now. Viki Pass Plus wont work! i bought viki pass plus, and i know i did because my subscription says i did, but viki keeps giving me ads and telling me to get viki pass to get rid of ads. What the heck is going on?? This app is awesome, if you’re a fan of kdrama then this app is the best place to go to. I can find all my favorite shows and new shows to watch and get hooked to, and for free! It’s great!! I thought it was just me skipping to find my place and going over the commercial so it was playing but now the commercials are constantly playing in the background of whatever video I am watching. I’ve stopped and exited but it continues to happen. Viki is easy and user friendly. I enjoy the various tv dramas being offered. Good selection to choose from. Only downfall is not all dramas are completely subbed title in English when they were marked as 100%. Dear Viki, I don’t mind ads but please put all the ads in the beginning of the videos. I don’t care if I have to wait a few minutes until my video starts as long as theres no ad in the middle of the video. The quality is amazing and I love how it says how much of the language there is on the subtitles! I love Viki so much! Best App for Asian Dramas! I appreciate their wide variety of, not just k-dramas, but also Chinese, Taiwanese, etc.. dramas, as well as variety shows like The Unit and Running Man! The ads are not nearly as invasive as other streaming apps—they happen fairly regularly, but they’re super short and there’s never a (1 of 3) ads situation where they’ll layer several ads into one break so it ends up taking entire MINUTES just to get back to the actual drama. I left the app for a while as the ads started getting more frequent and I was having problems with ads and pages glitching out. However, they seemed to have fix these problems, and it’s even better than before! Definitely my favorite drama-viewing app, highly prefer it to mainstream drama apps like DramaFever and the like. Highly recommend! Love this app, if you have the app it doesn't have many ads.❤️❤️ they do the best and it's a great app. I love this app. But recently, I can’t watch the shows that aren’t under the viki pass plus in America. It says I have to buy the basic. But the viki plus says I can watch everything plus the basic. Need to fix that, please! Why can’t they fix the double billing problem? I was told it was fixed but here it is again 2 months later. Website email was sent again and haven’t heard anything in 2 weeks. I am going to cancel next month if not resolved. What a rip off!!!! Doesn’t work with Samsung Smart TVs. Seriously!!!??? Now I know why I didn’t renew my subscription for so long. Yes, you’re able to install the app on your Samsung tv, but it doesn’t play! I subscribed again as I want to watch a show that DramaFever doesn’t have YET. BIG MISTAKE. I even tried watching from my iOS (iPad and iPhone) and used Airplay as I enjoy watching on big screen. It video played but no option to change or turn on subtitles. VERY FRUSTRATING. I tried troubleshooting and did the suggestions on Viki website forum, to no avail. VIKI- you expect your subscribers to pay and limit us to watching on a small screen? IT’S 2018, UPGRADE YOUR FREAKIN’ SYSTEM FOR PETE’S SAKE!!! I uninstalled the useless app and cancelled my subscription. If you like to watch Korean dramas this is definitely worth the money..I’m American but I’ve gotten hooked on Korean dramas..I prefer this over Netflix,Hulu,Amazon,wish I had found this sooner..
What is wrong with the latest Viki Update? Viki App for Chromecast the dubbing always lags since the last update. This is a problem on every device, mobile or tablet. So I used to pay for Viki pass until I realized that I literally could not watch my dramas anywhere besides my phone and computer. Viki has discontinued all their apps for the Samsung smart tv and the Xbox and those are the only two things I have to stream apps. I’m someone who likes to watch things on the big screen and having to connect my computer to an hdmi cord is just so tiring. It actually pisses me off. If you want more people to pay for Viki Pass, make yourself more available to more people. You say that you can stream these dramas anywhere with just the Viki but I’m afraid that this isn’t true as you have discontinued almost all of your apps. It’s useless. Besides having all your apps discontinued, it’s a good app. I use it to watch a lot of great shows like W and While You Were Sleeping, but when I want to watch on the tv so that I can get more comfortable, I have to watch on Netflix which is horrible because all Netflix has are the shows about teen girls fawning over men. So can the creators of Viki just make themselves more available to people like me who have an Xbox/Samsung Smart Tv? I subscribe to the Viki Pass $4.99 per month and wanted to upgrade to Plus $9.99 per month, but I was billed (it is in pending) for the yealy plus subscription. I have tried to reach out via the support channels, FB etc and havent received any update. For a paid service, you should at least have a chat feature so customers can quickly resolve these types of issues. Instead you leave them hanging and is a really really frustrating experience. 1/12 Update: There is still an issue on the app side. Viki Support was not helpful or quick enough to resolve my issue so I worked w Apple. In my Purchases (through My settings) says I was refunded. However the previous screen still lists my subscription as the yearly $49.99. Also, If I want to update my sub to viki pass the app says the sub won’t update until 1/18 while the purchase through my subs in settings says I can update now. This is a bug and should be updated. Okay, so I’ve been a VIKI user since 2012, and although the app has to continue bettering itself in order to keep the attention of users, I think there are definitely a few things worth mentioning. 1. Why do I need the pass to watch basically everything? There are lots of older dramas or even newer ones that you cannot watch unless you have the premium pass. I don’t understand why many older dramas were just blocked out. 2. Region. Once again, many older dramas I had seen before hand on VIKI are now set to “unavailable in my region”... like why? I don’t understand why. 3. Ads. Yes, I understand that the premium ver gets rid of all ads, but must there be ads every few minutes? It’s extremely uncomfortable that I just reply to a text and as soon as it opens up there are literally 5 ads. No thanks. This is an incredible app. The viewer comment streaming creates an amazing sense of community. Some people joke, spoil plots, and complain in wonderfully funny ways and across languages, French, Spanish, English, and Emoji. I’ve never felt so surrounded by other people while watching TV. It’s a marvelous experience. Can’t become a member. Just because most the shoe don’t even have Chinese subtitles!! After being recovering from abandonment issues, thanks to a different streaming service that I won't name. I'm now a paying member of Viki. One empty star for not having all episodes of Running Man. I don’t know if anybody’s app does this but whenever I sign into my account it will always log out by itself. It’s kinda weird because when I sign into it I don’t even watch it and the next day I have to sign in again. Love the shows but with high frequency of adds hard to enjoy. I really like this app I was a Dramafever watcher for a long time and when it shut down I found this app. At first very upset with it but learned to love it! Keep up the good work on this app can’t wait for more content to come to America! Love this App! Can’t live without it! Love being able to watch anytime I want, so many to see! Beautiful stories, Great action stories, it has it all! I really love this app. It’s just these ads. The developers take a long time to post English Subtitles. There are times that it takes days for a 30 minute drama. It’s not worth to pay when you can’t watch the drama you want. I signed up for the $29.99 annual special and you’re charging me $4.99 a month instead ($49.99) and I only get an auto-reply to my customer service emails. Pretty good. I like all the shows and the subtitles are up today’s. Only side notes for improvement would be if you can try to add more shows and lower a bit the ads for each episode 😭 there’s so many ads sometimes it can get a bit annoying but u get used to it. Also I would have given it a 5 if it hadn’t taken of the feature to screen mirror it to my TVs didn’t only allowed it if I were to move to premium. Besides that it’s great. I hate it and I miss drama fever. Every time a muted ad shows up the video becomes muted and I have to reload the whole app to get the sound back. It’s so inconvenient! Fortunately I’m patient to even deal with this problem. Just got the viki pass so I would not have to deal with ads, and I still have them. Even though the pass said no ads. Frustrating. I love this platform, it lets me watch shows I couldn’t otherwise watch. While true the adds can be annoying once in a while, they don’t happen often so it is not to much of an inconvenience, I would say to get it! This is the only place I can arch running man! Now there are only 12 days left to watch! Everyone that I know is mad and disappointed! Please don’t do it! Then we all have to go find another place to watch! Love this app. It is extremely easy to use!! I love the options available as well as the original programming! !